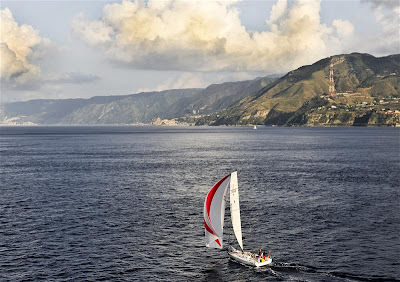 By sunset on Sunday evening a handful of boats in the 2011 Rolex Middle Sea Race fleet were facing the Strait of Messina. With the hostile current any boats still south of the Strait needed enough wind to get them through and luckily for most conditions were windier than forecast. 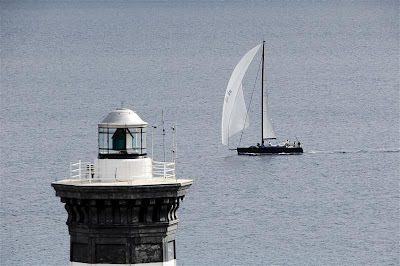 At 17:30 Skipper Dave Latham of Seawolf, a 38-footer from Gibraltar in Class 4 reported they were in great shape with the boat five miles from exiting the Strait, making eight knots over the ground under spinnaker, in a southerly breeze of 14 knots. British boat Nisida had lost some ground during the morning after having done well overnight. 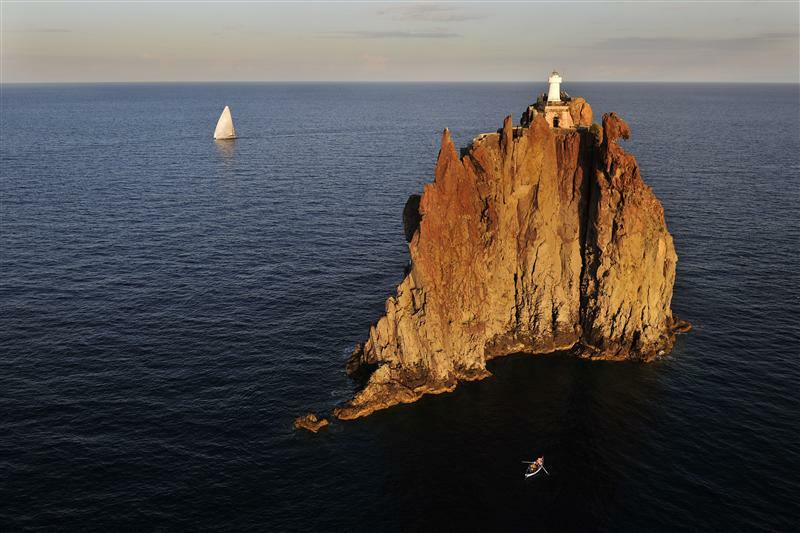 The Italians onboard Catty Sark Waterfront Fleqreo, an Azuree 40 were also glad to be clear and en route to Stromboli. Co-skipper Enrico Lanzillo called in to report, “We’re just out of the Strait. We have 16 knots of breeze at 140 degrees, with the gennaker up, and making nine knots. The tidal current was going against us, so we managed to go inshore and find a favourable eddy, sailing near the (mainland) coast." By 1800, race leaders Esimit Europa 2, Rán, and Alegre were around the corner at Stromboli and sailing along the top of Sicily. 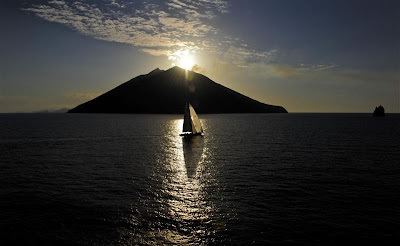 Esimit was approaching the northwest tip, near San Vito lo Capo, with Rán, approximately 88 nautical miles behind her, still off the Aeolian Islands, and Alegre a further 21 nautical miles behind, closing slowly. Over half of the fleet is now in the 35-nautical mile stretch of water between the Strait and the turn at Stromboli. Alegre was sailing a heading of 070 degrees at eight knots. “It was very painful getting to Messina, I must say. We should be further up to Rán, but that’s the way it is. We’ve got until Trapani to claw anything back from them and after that it’s pretty much a drag race home. The mood’s been up and down; there have been a few depressions, but it’s all pretty cheery right now. 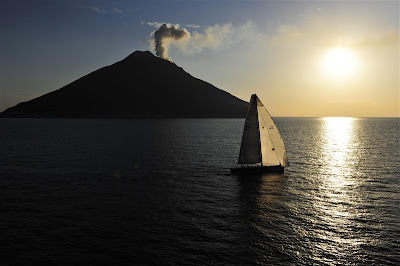 Just to get moving again after a long night last night was a big relief, and it was quite nice to sail through Messina this morning,” Alegre's navigator Will Best reported. “Kind of hoping for anything (wind). If it’s an easterly component and it brings more pressure down towards Rán, we can get into them a bit; if not, and they park up hopefully we can still get into them a bit. We look at the tracker and can see when they’re getting lifted and gybing, and it’s definitely an advantage being behind them, for sure,” Best added. Stromboli is part of the Aeolian Island archipelago, named after the wind god, Aeolus. The largest islands in the group are Lipari and Salina; others include Vulcano, Stromboli, Filicudi, Alicudi, and Panarea, as well as nearby islets. 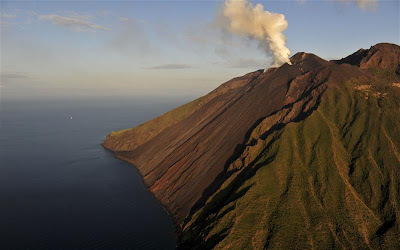 The islands are of volcanic origin and include two active volcanoes: Vulcano and Stromboli. Over 40 species of birds are found on the islands, including ten that are on the Sicilian Red List for threatened species.